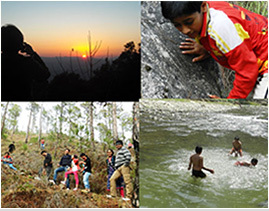 AyurVAID Kalmatia provides unique trekking opportunities, indescribably beyond the realm of words, allowing you to experience pristine Nature, the tallest Himalayan Mountains and the unique culture of Almora, the first British Hill Station (1815) in Kumaon, Uttarakhand. A slice of heaven in the western Himalaya, Kumaon lies at the feet of some of the tallest mountains in India – Nanda Devi 7816m, Kamet 7756m, Trishul 7120m, Nanda Kot 6860m and the PanchChuli 6903m. Bordering Tibet to the north and Nepal to the East, this un-spoilt area of India offers soft trekking through some of the most awe-inspiring scenery imaginable. The Treks also provide an insight into the lives and daily routine of the Kumaoni villagers. After a day‘s trek, you enjoy a revitalizationregime at AyurVAID Kalmatia which rejuvenates you for another day of stimulating and refreshing experience, pure, in the cradle of Nature. And enjoy an energy-meal of ancient recipes. We also enable overnight stays in village houses which will give you the chance to experience their warm and genuine hospitality, allowing you to immerse yourself in a thriving ancient culture whilst enjoying the simple pleasures of village life!The villages’ traditional houses made using stone, wood and slate, have interior mud walls and lime coated floors, keeping them cool in the summer and warm in the winter. Partially renovated with outhouse bathrooms and western toilets added, the houses are rustic but clean and comfortable with all basic amenities. Hot bucket bath, fresh towels, linens and organic hand-made soap produced locally are all provided at each house. TraditonalKumaoni food is cooked hygienically and mineral water provided. You are accompanied throughout by a local and experienced English speaking guide. From day 3 to day 6 your luggage is carried by our young local porters. The walks end each afternoon at a different village house.